Bearded, disabled blogger, having a moan and reviewing products! Who is behind the brand? Tactical Beard Care ‘Tactical Treacle’ Beard Balm is one of those products that smells so good it could be edible, but of course that wouldn’t be recommended. 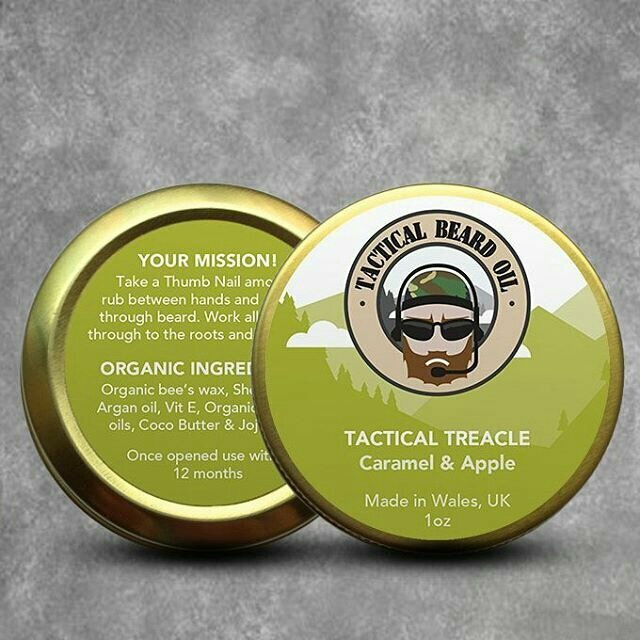 ‘Tactical Treacle’ Beard Balm from Tactical Beard Oil is Apple and Caramel scented, the scent is, damn how do I describe this, it’s balanced perfectly with the apple and caramel each of the aromas not out doing the other. Okay, I could try to describe this all day and I still wouldn’t do the scent justice. Tactical beards describe it like this ‘The result was a rich and creamy caramel warmth ending with a bitter but sweet green apple snap at the end’. Basically its Apple and Treacle heaven! The balm itself is made from Shea Butter, Coconut Oil, Bees Wax, Jojoba Oil, Argan Oil all of which are Organic, Vitamin E oil and then a blend of essential oils. The balm is a firm balm but not too firm, its easy to scoop some out. It feels really good on your beard, giving a good hold and making my beard look really good. Edit: The balms have developed a grainy or lumpy texture over time and I have had a few messages about this. The answer is to spend time working it in your palm or to place the tin in hot water until the balm liquifies and then let it set again. I have to say that really you just need to go to The Tactical Beard Oil website and buy a tin. It’s a 30g/1oz tin that will cost you £9.99 for the privilege or £7.49 on subscription. You can keep up to date with Tactical Beard Oil on Twitter, Facebook and Instagram, they are constantly working on new products and I am confident that they are set to become a big player in the Beard care market! My top brands and what products do I recommend? Has your beard care product been safety assessed?